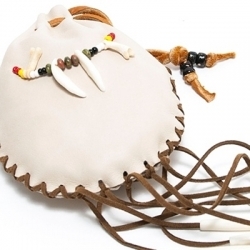 The medicine bag is an ancient item mostly used by North American Aboriginals that spiritually represents the person who wears it. The Medicine Bag may hold supernatural items and/or hebrs but the medicine bag also has power from itself. They most often hold items like animal furs/teeth, special stones, or other objects that mean something to the owner. No person, apart from the owner, is allowed to take a look inside his/her bag. All items are handmade and one of a kind! Medicine Bags There are 13 products.